I am not much of a baker. My repertoire of baking is limited to the cake mixes. I can make a decent cake with the boxed mixes I have gotten this recipe from the professional baking book.. and made some changes to it as i do not have any more eggs!!! I wanted to try it without the eggs. The reason for this is two-fold.Iam a pure veggie and I just don't like the "eggy" smell, and try to avoid it . 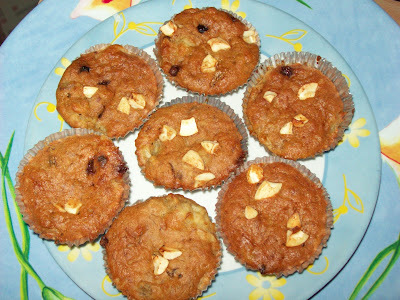 One of my most favorite Muffins, which I think is the King of all Muffins, is the ‘Banana Nut Muffin’ They came of really well. Very soft and Fluffy. 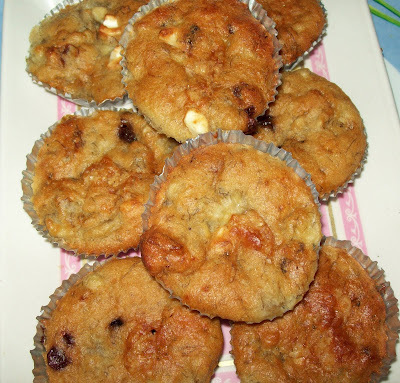 These Muffins filled the Room with the Banana Flavor. . Here is how I made the Muffins. In a large bowl combine the flours, , baking powder, baking soda, and chocolate chips. Use a whisk to combine. Set aside. Place butter, milk and sugar and mix (with a manual whisk) until thoroughly well blended and then add on the mashed banana. Pour the liquid mixture into the flour mixture. With the spatula, gently fold all the ingredients to form a wet batter. Just mix until the flour are incorporate into the batter. The batter will appear lumpy. The Flour must get moistened. Mix well only for a minute or two. Do not use any kind of Electric Hand Mixers. 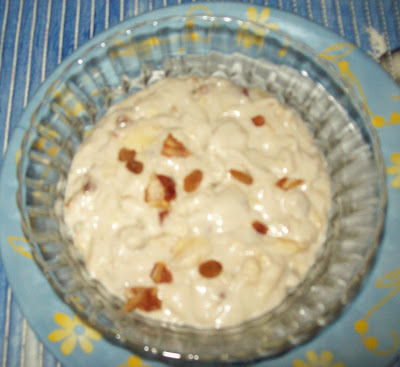 Keep aside 1 tablespoon of Finely Chopped cashew nuts, dates, raisins and stir in the remaining nuts in the batter. Sprinkle the remaining nuts on top. Bake it in the Oven for about 35 minutes approximately, until the Muffins are golden brown. Is it possible to bake cakes in a microwave? soo yummy and little cuty ones they look....i luv muffins a lot at the time of breakfast...its filling...urs looks tempting.. Thanks Sameera,It is possible; we can bake cakes in a microwave. Thank you suma,Sripriya,Purva,kitchen Flavours for loving comments.